Fauza Mohamed B.A. (Hon. ), J.D., M.S.W. Fauza is a strong advocate for her Family Law clients. Whether in the Courtroom or during settlement negotiations, Fauza represents her clients’ interests fearlessly, fairly, and with integrity. Fauza understands that family legal matters are stressful. Prior to law school, she earned a Master of Social Work degree and coordinated community programs for children and families at a Community Health Centre in Ottawa. In her legal practice, Fauza is solution-focused and strives to assist clients in reaching a fair and effective resolution to their legal matters in a cost-effective manner. Ensuring that individuals are well-informed about their legal issues and options is a priority for Fauza. 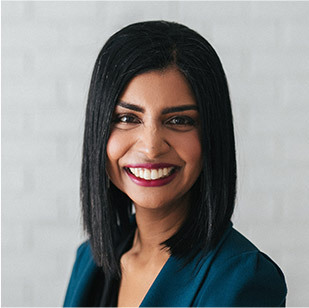 Prior to joining Brown Law Group, Fauza articled and practiced at a boutique labour and employment law firm in Edmonton where she gained valuable litigation experience. In law school, Fauza was awarded the BLG Research Fellowship, and was part of a team from the University of Alberta that placed third nationally for its research factum at the Wilson Moot Court competition in Toronto. In her spare time, Fauza enjoys hiking, cooking, listening to live music, and being involved in the community.